Established in 1933, the Kenosha Public Museum’s collections have grown to over 80,000, including 1,200 works in the fine arts collection. Exhibit programming includes world cultures, American Indians, zoology, geology, fossils, and fine and decorative arts. Enjoy world-class art, artifacts, and natural sciences from around the world and throughout time. In the permanent exhibit, “The Wisconsin Story,” experience changes in climate, development of ecosystems, and the life of American Indians in Wisconsin. Marvel at the exhibit’s highlight, the Woolly Mammoth, excavated right here in Kenosha County. Temporary fine arts exhibits feature national touring art shows, well-known book illustrators, and cartoonists. The Museum boasts multiple exhibit and gallery spaces, stunning views of Lake Michigan, a gift shop, and free on-site parking. Reservations are required for groups of more than nine people. Group leaders and bus drivers receive complimentary admission. For group rates and booking information, contact the group tour coordinator at 262-653-4433 or email thaase@kenosha.org. You may also use our Adult Tour Group Reservation Request form to reserve a date and time for your group tour. 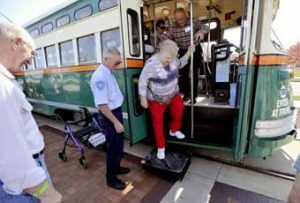 When you visit, consider a ride on Kenosha’s authentic electric streetcar system. The streetcar stops right next to the Museum. The Kenosha Public Museum is located in beautiful downtown Kenosha. Experiencing our historic downtown neighborhood is just one of the many perks of visiting the Kenosha Public Museum. 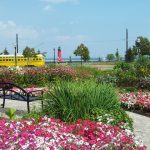 Located along the scenic shores of Lake Michigan, downtown Kenosha is a vibrant neighborhood with distinctive shopping, dining, parks, and cultural opportunities for all. Here is more information on the happenings, area attractions, and recreational activities in our neighborhood.